Back in February last year I wrote a post on my Hobby Goals for 2017 and decided to do the same again this year (probably ought to try and remember to do it in January next year). I have managed to do a fair bit of hobby stuff these past 12 months, admittedly not as much as I would have liked, but I thought I ought to do a bit of a year in review again and set some goals for this next year. Unfortunately I have been quite ill this past month and will be on medication for the next few so I may not end up being as productive as I would like but hopefully things will pick up soon! 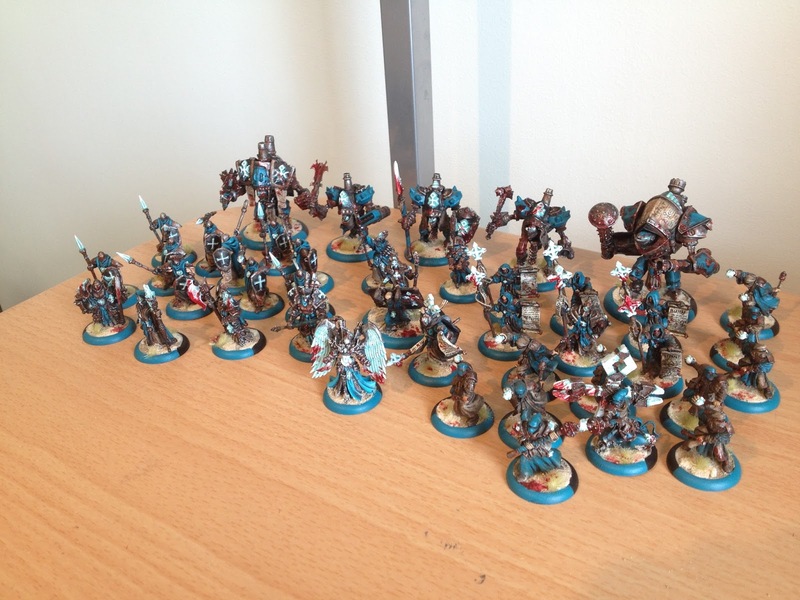 - Menoth - I actually got this army finished! It was a bit of a slog halfway through but I'm happy with the gritty, alternative look for the Protectorate I have achieved. Unfortunately I don't really plan of having any games of Warmachine in the near future and I have no intention of adding to this force any time soon so I think I'll be putting it on display. - Amontekh the Arboralist - This random late-year mini-project for my Rogue Trader character was a fun distraction from work. Unfortunately I have had to temporarily drop out of my Rogue Trader games until my health improves, but hopefully Amontekh will reactive his reanimation protocols soon! - Scourge Privateers - I started this small war band for Age of Sigmar during the summer, inspired by Nick Horth's fantastic book: City of Secrets. Just before Christmas I managed to get them finished, which at least stopped a new random project carrying over into the new year! 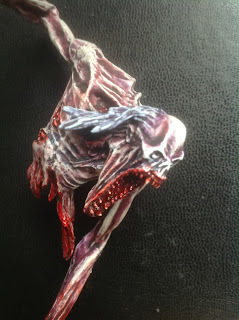 Pictures of the finished miniatures will appear on the blog when I get round to photographing them. - Dark Angels - Over the summer I begun an army-wide repaint, as well as minor conversion works on my Dark Angels. I forgot to take pictures over the summer but managed to get one or two over Christmas just to prove I have been working on them! I've decided to go for a metallic green look using some of the technical paints which is still rather WIP but is proving lots of fun to experiment with. - Witch-Hunters - I also begun an army-wide repaint of this force, as well as the addition of new miniatures. Problems with desk space in my new apartment and St. Celestine's wings (I cant get them quite right) has hampered progress and motivation. - Misc. Kingdom Death - There has been some small progress with my backlog of Kingdom Death miniatures. I have completed some more pin-ups but I still haven't gotten around to photographing any of my stuff and putting it on the blog. - Shadow War - I started a Astra Militarum Shadow War gang which I'm hoping to perhaps use for Necromunda and other 40k skirmish games as well. This is mostly in the planning/assembling stage and I don't have any photos yet. - Misc. Age of Sigmar Stuff - I have managed to paint a few random miniatures for Age of Sigmar. Not as many as I would like but some have been done. When I've made more substantial progress I'll post pictures. - Malifaux - I have started to play Malifaux which has been great fun. I got the Guild's Judgement crew box which I've started work on and I also got a few random miniatures for Christmas I cant wait to get some paint on as well. - Lich Warband - steadily progressing but never seemingly enough to warrant an update. Though I started strong on this project (and didn't put any of it on the blog, typical!) it has slowed to being something I work on while I wait for other things to dry, hopefully I can get more work done on it soon. 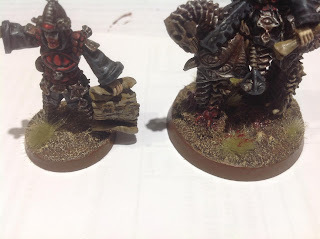 - Flesh-Eater Courts - Unfortunately, despite my big plans for my Age of Sigmar army I have not managed to get any progress done on my ghouls. Part of this is due to the amount of 40k hype that has been going on this past year (which prompted the Witch-Hunters and Dark Angel repaints) and that I currently don't have space in my new apartment to get this large project out to work on. I am hoping that the 'Malign Portents' event will give me the motivation to get on with this project, even if i don't participate in the campaign itself. - Imperial Guard - I actually forgot this was an ongoing project! I'll no doubt turn to it when my Witch-Hunters are done. 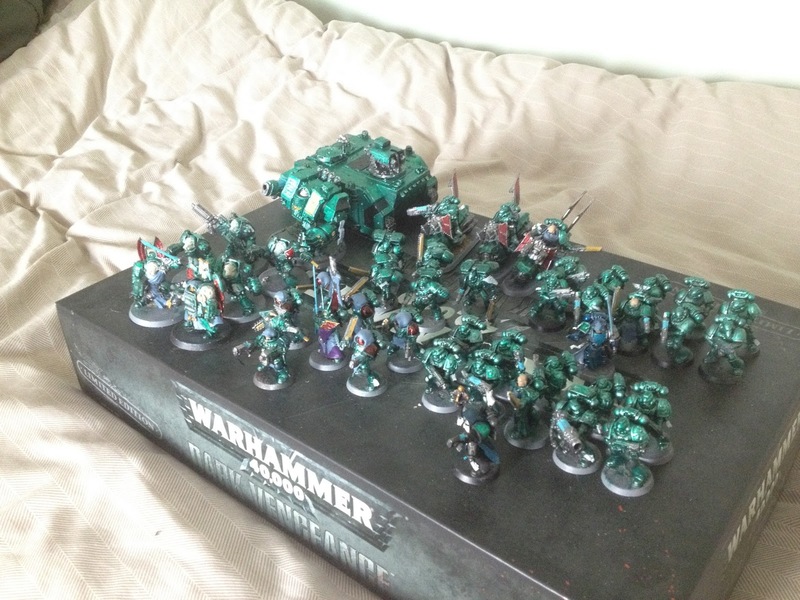 - Get some 40k armies finished!! 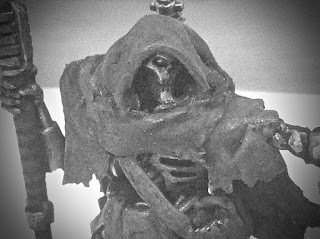 - firstly I need to get some 40k stuff finished as my Witch Hunters, Dark Angels, and Imperial Guard are all stuck in a kind of limbo as I am working on them. I probably ought to have just chosen one to work on but hopefully I'll start getting through them this year! - Work on my Flesh-Eater Courts - With Malign Portents approaching I think I'll finally get round to doing some meaningful work on my undead armies. 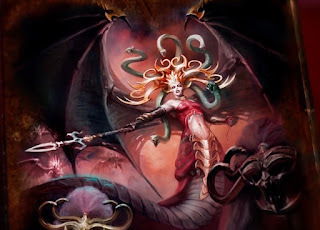 I have been quite enjoying the build-up and mystery surrounding the next phase of the Age of Sigmar, and I think the campaign they are running looks increasingly interesting, though due to my health and backlog of other projects I don't think I'll have the chance to play and paint along. 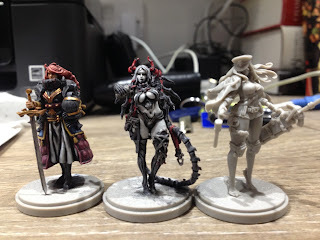 - More Malifaux - I have quite enjoyed working on my first crew and having played a brief game over Christmas I think I could really get into this! 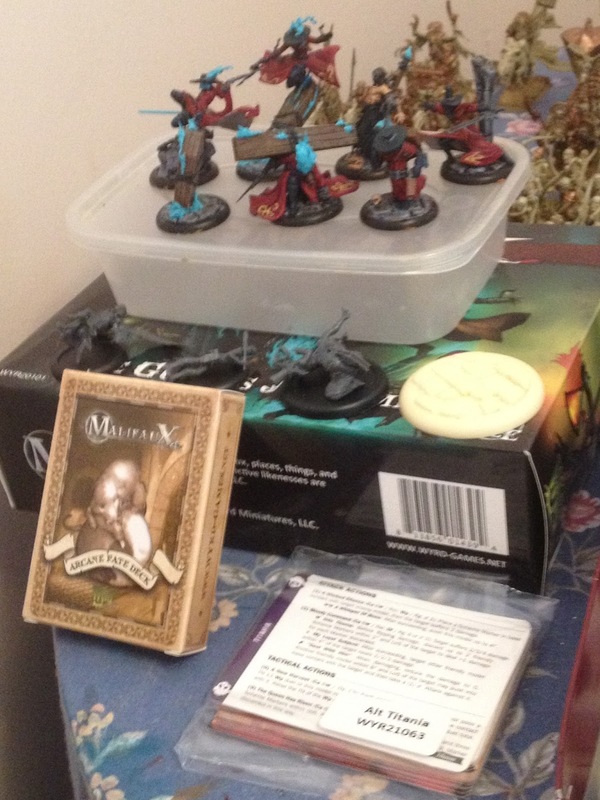 I think I would like to not only get some more Malifaux miniatures but get some more games in as well. The use of a deck of cards instead of dice is really interesting and quite fun even if luck is very rarely on my side! In fact I'm already making plans to increase my Lady Justice crew and am contemplating which master I might buy for my next crew so I have a bit of variety. Looking forward to when Morathi's new miniature comes out! - Daughters of Khaine - Dark Elves were my first Warhammer love and I don't think I can possibly resist such awesome new miniatures. I don't know when the new Daughters of Khaine will be coming out, so I think I'm going to have to try and get my Flesh-Eaters painted before they are released! 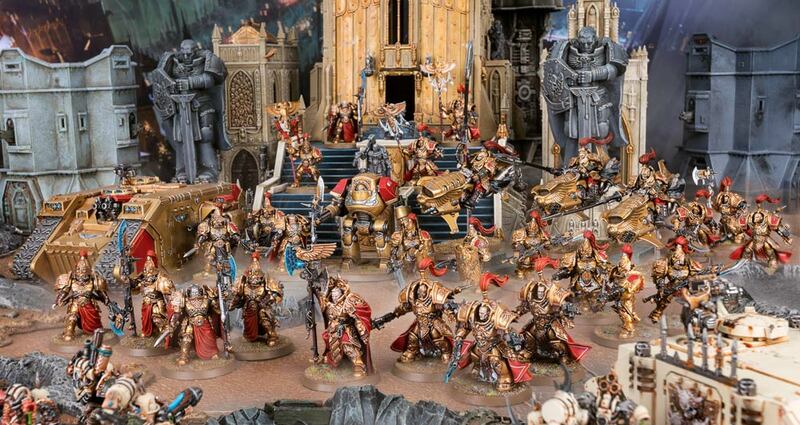 I can already feel my wallet cringing and if anything is going to derail my plans for hobbying this year it will be the army of the Shadow Queen. I do already have a bit of a head start as I can rebase and repaint some of the miniatures from my old Dark Elf army (some Witch Elves, Warlocks, a Medusa, and a Cauldron of Blood), so I can just add some of the new stuff when its released and hopefully have a decent force. As usual I have started or just worked on far more projects than actually finishing. I do naively believe that one day I will just have one or two projects going on at a time! In order to motivate myself I have decided that every time I finish a project, I will treat myself to a box of Custodes. 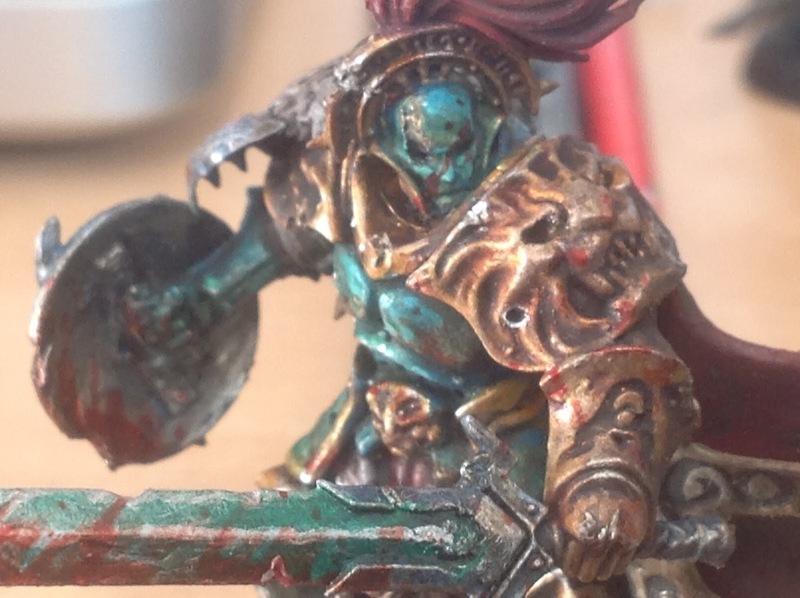 I love the miniatures, in fact it was the preview of Captain-General Trajann Valoris that made me decide I wanted to do a small force of them as I thought his model was just brilliant. Hopefully such motivation will allow me to hurry up and get some things finished! I just love these two miniatures, I cant wait to get my hands on them! While my health is not the best right now, and university stuff is pressing, I do hope I will be able to make the time for a bit of hobbying every now and again. In fact this past week I have managed to get some more paint on my Malifaux miniatures though they are still a ways from being finished. 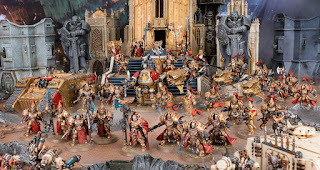 The year ahead look interesting and I hope that I can get plenty of painting done, get a few games in, and make some new purchases. I'll do my best to keep the blog updated and when I do this again next year I plan on having gotten more done!